How will Games Lanes affect Olympics? At the Atlanta Olympics, home hero Michael Johnson achieved a 200m and 400m double, 35-year-old Carl Lewis picked up his ninth gold in four Games by winning the long jump and Kurt Angle won the wrestling with a broken neck. The Olympic flame was movingly lit by Muhammad Ali, and two people died when a lone bomber set off a device in Centennial Olympic Park. So it is telling that the issue many associate with the 1996 Olympics is its transport debacle. Athletes got shouted at by officious security officials and were delayed getting to events because bus drivers got lost. London 2012 organisers are adamant they will not make the same mistakes. Since Sydney 2000, dedicated so-called Games Lanes have been introduced to guarantee safe, secure and reliable transportation on key roads linking Olympic venues for athletes, officials, media and sponsors. In 2004, Athens opened the lanes 11 days before the Games started and in 2008, Beijing had them in operation 19 days before the opening ceremony. For London 2012, the Olympic Route Network (ORN) - covering 170 miles of UK roads, as well as 109 miles in the capital, a third of which will have Games Lanes - will start operating just two days before the Olympics, and will be used for three weeks. What are the Games Lanes? A Paralympic Route Network will operate on a smaller scale during the Paralympics. Many road-users fear the result of the extra traffic restrictions across the ORN - including closed side roads, banned turns, suspended parking, diverted buses and changed traffic signals - will be increased congestion. Games Lanes will operate on the busiest section of the network - around Heathrow and Wembley Stadium, through central London and out to the Olympic Park at Stratford. An extra three million journeys are expected in London on the busiest days of London 2012 , and while organisers say 70% of roads in Greater London will see no impact, critics say the impact on London's already-busy road system will be widespread traffic jams. Businesses fear delays in the delivery of everything from bread to blood , taxi drivers worry the jams will cause a four-fold increase in fares , residents are concerned about curtailed access, and parents worry for increased risks to children caused by roads becoming rat-runs as commuters flee the ORN. They wonder why, when London is being hailed as the greenest Games yet, with 9m ticket holders urged to use public transport, walk or cycle to events, sponsors will be ushered around in chauffeur-driven cars and International Olympic Committee officials will be based at hotels in Park Lane - eight miles from the Olympic Park. Everyone understands transport is a really big deal. If we ever talk about Games transport, Atlanta 1996 comes up quickly because athletes had such a bad experience. The bus drivers were reportedly brought in from outside the city and given specific directions rather than maps so it was easy to get lost. Some people missed their competitions, which is not good for the individual, the team or, in terms of reputation, for the city. It's bad enough worrying about your competition without worrying about the food, transport, accommodation and everything else. At Sydney 2000 it was much better. And I think where London has done an amazing job is the athletes' committee has looked at every decision Locog has made from the perspective of the athletes. If you make it good for the athletes it's good for everyone else. You find that it's a different experience during Games time - it's not a normal commuting experience. I was impressed with the volunteer system at Beijing, and it's been something we've been pushing for in London, so that for example if a wheelchair-user arrives at a Tube station there's someone there who can give them the right information about the best way to get where they want to go. Outside London, car owners in Dorset say a planned tripling of park-and-ride prices near the Weymouth and Portland sailing venues "beggars belief". 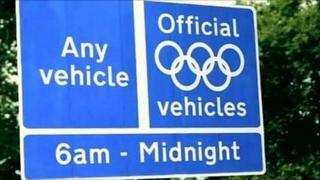 The Olympic Delivery Authority says the increase is necessary to cover extra staffing and security at the site . In Windsor, the racecourse will be used as a public transport hub from where spectators can board shuttle buses for the events at Eton Dorney rowing Lake, but locals fear ticket-holders will cut costs by using their own transport and parking cars in residential areas. "I find it disgusting that with only a few months to go we the residents don't know what is happening as far as the Games are concerned," local resident Ted Shepherd told the BBC. Meanwhile, passengers arriving at Heathrow just before and just after the Games have been warned of lengthy delays as passport control officials are redeployed to cater for athletes using dedicated passport lanes. Even those with tickets are concerned about the logistics. Software engineer Jonathan Larmour lives outside Cambridge and is worried about taking his eight-year-old son to a Judo session at the ExCel Centre, which begins at 0930 BST, because of the clash with the morning rush hour. "The combination of the entirety of London commuters and Olympic visitors trying to use the transport system at the same time is surely bound to bring the capital's transport system to its knees," he told the BBC. Organisers say the Games Lanes will only be used on roads with more than one lane and will often replace bus lanes, thereby reducing the disruption caused. They add that while VIPs and sponsors will be shuttled around in a fleet of 4,000 BMWs, most Games Lanes users will be transported in 1,500 coaches. Extra buses, trains and Tube services will be laid on to cater for the extra demand. TfL has spent £6.5bn on extending lines and upgrading London's traffic network ahead of the Games, while a state-of-the-art transport nerve centre will aim to keep the capital moving and provide live traffic information to media outlets. Transport for London (TfL) - which manages transport services across the capital - aims to reduce congestion during London 2012 by persuading businesses to stagger working hours , plan delivery times, promote home-working and encourage staff to take alternative routes into work. It says small businesses have been consulted throughout the planning process. TfL is holding 230 free workshops in London and across the UK over the next three months to help hauliers and their customers keep running during the Games. It is holding regular meetings with unions like the London Taxi Drivers' Association to discuss Olympics transport concerns. Transport Commissioner Peter Hendy told the BBC: "We have two clear objectives at TfL - to support the delivery of a great London 2012 Games and ensure we keep London moving and open for business." TfL also says that as well as councils and businesses, members of the public have been fully consulted on the ORN proposals, which the transport secretary is expected to sign off as traffic regulation orders in the next two months. Even once the orders are formalised, TfL says the engagement process with the public will continue. "If people have concerns, difficulties with access or deliveries, or are just unsure about what the ORN means for them, we need them to get in touch ," TFL Surface Games Programme Director Graham Jones told the BBC in November. But with just six months to go before the opening ceremony, analysts say the time available for consultation on the ORN that could lead to significant changes has probably passed. Transport, along with security, is an area of Olympic contingency that is impossible to plan for fully, says London School of Economics transport expert Tony Travers. "We'll only really know how the transport system is going to work when it's working," he told the BBC.